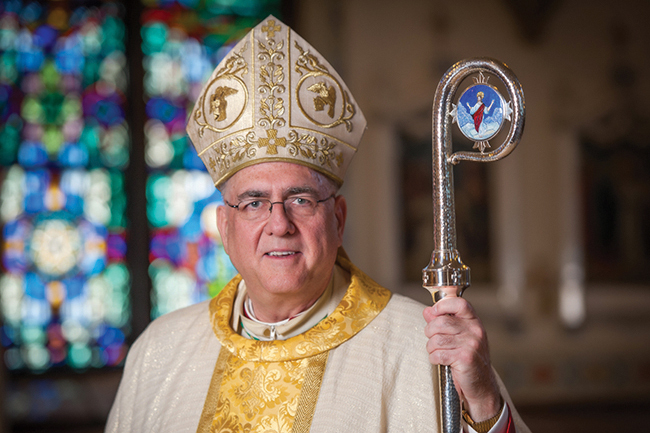 Editor’s note: Below appears Archbishop Joseph Naumann’s homily for the Vigil Mass of the March for Life at the Basilica of the Immaculate Conception, Washington, D.C., Jan. 17, 2019. For all Catholics, the last several months have been profoundly difficult. We have been devastated by the scandal of sexual misconduct by clergy and of past instances of the failure of bishops to respond with compassion to victims of abuse and to protect adequately the members of their flock. The abuse of children or minors upends the pro-life ethic because it is a grave injustice and an egregious offense against the dignity of the human person. Moreover, the failure to respond effectively to the abuse crisis undermines every other ministry within the Church. Dr. Bernard Nathanson, one of the founders of NARAL and himself an abortionist, became pro-life not because of theology or any religious sentiment, but from his own study of the scientific advancements in embryology and fetology. While it is true that Dr. Nathanson eventually became Catholic, it was long after he had become a pro-life advocate because of science. It takes much more faith to be an atheist than a Christian. Think about it. An atheist has to believe that the cosmos, the universe, solar system, the complex beauty of the natural world, the miracle of the human body, all happened by chance — against all odds. There is a reason that the scientific method developed in a Christian culture. There is a reason that the vast majority of scientists until very recent times were devout believers. Unless you believe that there is predictability in the universe, science really makes no sense. This predictability within nature reveals an amazingly intricate design throughout the cosmos down to the tiniest molecule. This design has the finger prints of the designer — God. In the very first chapter of the Bible, God reveals important theological truths. First, without God there is chaos. Second, all of creation is good. Third, many of the wonders people worshipped as divinities — the sun or moon or certain living creatures — are not gods, but they are creations of the One True God. The choice by our first parents to deny God’s lordship, to refuse to do his will — to seek to be their own god, had disastrous results. It brought back the original chaos — a moral chaos. You want a glimpse of this moral chaos, just read a newspaper, watch the evening news, or observe the nihilism present in much of our art, music, literature, and films. If you want to view a powerful illustration of the tragic consequences of this moral chaos, watch the movie Gosnell: The Trial of America’s Biggest Serial Killer. What a blessing our Christian faith! We not only believe in a God who created the cosmos and made us in his Divine Image, but we believe in a God who pursued us even after we rebelled and attempted to push him out of our world. We believe in a God who loved us so much that he became flesh, he became a human being. Why? So that he could redeem us and make it possible for us to share in his divine and eternal life! We believe in God who not only created us in his image, but a God who died for us so that we might have eternal life in him. If you want to know the value God places on every human life, just contemplate the image of our Crucified Lord. Tonight, we heard proclaimed a very small portion of St. Luke’s Passion Narrative. Jesus entered fully into our human condition. Our Lord endured the greatest injustice in human history as a result of our sin. On Calvary, Our Lord does not lash out and curse those who have accused him falsely and plotted his cruel execution. Instead, Jesus begs the Father to forgive the soldiers who nailed him to the Cross. Ours is a movement that is all about love and mercy. We give thanks for amazing Paul- like conversions of abortion advocates, who have become the powerful pro-life apologists. As we pray through this night and we march tomorrow, let us pray that we can be great and effective witnesses for life, witnesses for love, witnesses for mercy. If you see only one movie this year, see the movie Unplanned. I warn you — Unplanned is painful, graphic and yet inspiring. The movie depicts the true story of the prayers and compassion of pro-life sidewalk counselors being the human instruments that God used in bringing a former Planned Parenthood Clinic Director, former Employee of the Year, Abby Johnson, out of the abortion clinic into offices of 40 Days For Life. Today, Abby Johnson is devoting her talent and energy to helping others make that journey from the horror of assisting with the killing of the innocent to the joy and peace of God’s mercy and grace. Pray that through God’s grace there will be many more Norma McCorveys, Bernard Nathansons, Beverly McMillans, Carroll Everetts, Ramona Trevinos, Abby Johnsons, who will come to know they are made in the Divine Image and that they are of such worth that Jesus died for them. May our advocacy awaken the hearts of others to know Jesus’ desire for them to experience abundant life in this world and to share with him eternal life in paradise! Beautifully written. Powerful, thought provoking, & soul searching. Because a woman so loved the child she carried, I have a very special 12 year old granddaughter.She knows she is loved by both her biological mother, as well as her adoptive parents. She has talked with her biological mother & biological grandmother on the phone. May she someday meet them in person & may in knowing how much she is loved may she value the life of all forever. What a beautiful sermon! Thank you for sharing this sermon here and in The Leaven. The Archbishop is a wonderful witness for pro-life and for the Catholic Church. It is such an honor to have him represent us . He and the pro-life cause is in my prayer. Beautiful words/homily, Archbishop. I am proud be amongst your flock in NE Kansas!